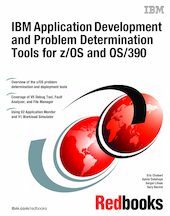 This IBM Redbooks publication introduces the IBM Problem Determination and Deployment Tools for z/OS and OS/390 . This comprehensive suite of powerful yet easy-to-use tools helps developers to efficiently build, test, and service applications while minimizing errors and increasing cost-effectiveness. The tools allow users to quickly identify and resolve problems that occur in batch, IMS, DB2, CICS, and UNIX System Services applications. For each tool, this book provides step-by-step instructions for installation and customization, a detailed discussion of the features and capabilities, and guidance for using the tool in your environment. Practical scenarios demonstrate how to apply the tools to monitor, manage, debug, and analyze applications in a real-world environment. Chapter 34. Is the error in DB2 data or program logic?